Waterloo-based BlackBerry QNX and the Canadian Government will invest $350 million towards autonomous vehicle development. Of this, the federal government’s Strategic Innovation Fund will fund $40 million and BlackBerry QNX will fund $310.5 million. The new funding is expected to create 800 new jobs over the next 10 years and maintain 300 existing ones. BlackBerry QNX, a unit of BlackBerry focused on developing secure software for vehicles, has formed partnerships with many leading tech firms to drive (pun intended) self-driving vehicles forward. In late 2017, they partnered with Qualcomm to work on virtual cockpit controllers, telematics systems, control gateways, digital instrument clusters and infotainment systems. BlackBerry QNX has also worked with Chinese search-engine giant Baidu to build a safety operating system for their open autonomous driving platform, Apollo. In addition, the company has partnered with Pana-Pacific, a leading distributor of truck and safety components, to sell its BlackBerry Radar vehicle tracking system in dealerships across North America. Canadian quantum computing pioneer, D-Wave Systems, has unveiled a prototype of its new hardware architecture, called Pegasus. D-Wave claims this new system will greatly boost performance by connecting each qubit (quantum bit) to 15 other qubits. This greater interconnection will enable the solving of larger problems than the company’s previous architecture, Chimera. 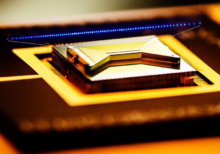 The Lawrence Berkeley National Laboratory has built a new electron detector that can capture atomic-level images at rates 60 times faster than current devices. 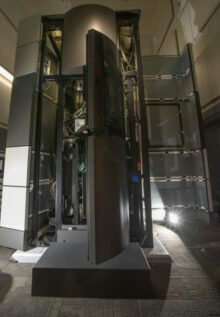 The detector, called the 4D Camera, outputs a massive 4 Terabytes of data per minute. The 4D Camera is expected to open new doors in the field of electron microscopy, enabling scientists to record entire movies of experiments rather than relying on single static images. One possible application is improving the manufacture of batteries and microchip components by detecting atomic-level defects. A recently-released paper details how researchers used an ion-based quantum computer built by Maryland-based IonQ to calculate the ground state energy of a water molecule. Current quantum computers use superconducting rings to perform calculations. In contrast, ion-based machines use strings of ions (atoms with an electron removed) floating in a near-perfect vacuum, confined by electric fields and manipulated with lasers. Though the water molecule calculation can be done by conventional computers, the large number of operations it requires highlights ion computing’s advantages. Ion-based quantum computers can greatly outperform superconducting ones but engineering them at a commercial scale has proven challenging. In an interview with the Ark Invest podcast, Elon Musk claimed that a new chip developed in-house at Tesla Motors can run AI 20 times faster than Nvidia’s Graphics Processing Units (GPUs). Musk sees big data analysis by AI as the key to creating safe self-driving vehicles. To this end, Tesla plans to use the chip to analyse a massive dataset from 1 million electric cars.